Moving from Philadelphia, PA to Fort Worth, TX? Fort Worth is a major city in the State of Texas, with a population of 800,000 people. The city is known for its Western heritage. Here you can see cattle drives twice a day, watch a rodeo, visit historical landmarks, and try local cuisine. 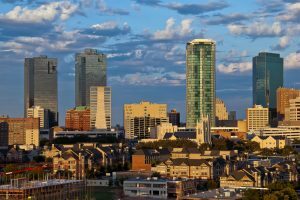 Some people do not just visit Fort Worth but relocate here for career and business. If you are planning a long vacation in Fort Worth, or moving here, you should consider using car transport services. With our company, you can ship a vehicle from Philadelphia, PA to Fort Worth, TX safely, quickly, and for an affordable price. There are over 1,500 miles between Philadelphia and Fort Worth. Driving between these cities would take you over 22 hours. If you are not planning a road trip and just need to move a car, driving across half of the country probably does not seem like the best idea. Fortunately, you can avoid gas expenses and all the stress of such a long drive. Instead, you can simply use Fort Worth auto transport from Philadelphia. Philadelphia Car Transport is your auto shipping expert at moving all types of vehicles state to state. We will be happy to help you with shipping a car to Fort Worth from Philadelphia! Our car carriers deliver vehicles door-to-door with great professionalism and following all safety regulations. Shipping with Philadelphia Car Transport, you will get high-quality services at some of the best prices in the industry. Give us a call today and get a special discount! You can request a free estimate over the phone or online through our website – just fill out a simple form.